At a dinner conversation in Beijing a few months ago, a Chinese bureaucrat asked me all sorts of questions about India, right from the country’s power generation capacity to public transport in major cities. When it looked obvious that my country was lagging behind his, my host bluntly said that democracy is really a bad concept. “There’s too much freedom, no control of any kind,” he said. “If we, the parents, allowed immature children to make decisions for us since they were in the majority, the whole family would suffer.” The bureaucrat went on to say that Western ideologies imposed on the East would be disastrous. I didn’t want to point out that communism isn’t a product of the Tang Dynasty, but I will concede that the man had a point when it comes to democracy: it can lead to chaos. India is justifiably proud of being the largest functioning democracy in the world, no matter how flawed it can be from time to time. Except for the period of the Emergency in the 1970s, the country’s democratic institutions have been more or less untouched. This isn’t to say that India doesn’t have extra-constitutional elements that are out to take matters into their own hands, but in all fairness governments have behaved with a sense of responsibility for the most part. No matter what critics have to say about Russian democracy, it functions well. There are those in Moscow, the Western-oriented liberals who want a different set-up in the country. Frankly, they don’t represent the views of the majority and this is why we didn’t see any major changes in the country after the 2012 elections. Ukraine, a young democracy which was a member of the Soviet Union, has a serious identity crisis. The East-West divide is sharp in the country. It would be wrong to entirely blame one side for the violence that has engulfed the country over the last few days. It does take two hands to clap. However ultra-nationalists and neo-nazis have hijacked the movement that calls for greater Ukrainian engagement with the European Union. Politics makes strange bedfellows, but does the EU really want to swing a country under its sphere of influence using armed xenophobic thugs who profess ideologies similar to those people in the 1940s that caused the greatest amount of destruction that the European continent has ever seen? Russian Foreign Minister Sergey Lavrov has a point when he says, “Demands are sounding from Western European capitals to give the Ukrainian people freedom of choice – but they quickly add that the choice should be made in favour of Europe, in favour of the European Union.” What kind of democracy is that? It is imperative that the nation that lies right in between Russia and the EU does not plunge into total anarchy. 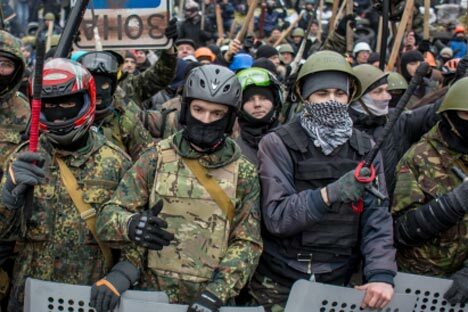 The violence in the country has already spread beyond Kiev. Democracy can be a messy affair, but in all honesty, it’s the best system that the world has at the moment. If the Ukrainian government is forced to capitulate under blood and violence, it sets a very bad precedent in a country where a large number of citizens dream of being citizens of a democratic space in the continent known as the EU. It would be a real shame if a democratically-elected government is forced to come down on account of a violent agitation. In a democracy, a government that has been voted into power through a constitutional process has the right to serve out its term. That’s just how democracies function. It’s up to the people of Ukraine to decide who runs their country, but only by democratic means. Many in India in 2009 didn’t think the UPA government would come back into power, especially six months after the 26/11 attacks on Mumbai. But the government was elected by a majority of the people in the country and those who voted for the opposition had to live with that. Ukraine is a beautiful and bilingual country that is located at a major crossroad and can actually be a bridge that brings East and West together, not to mention a major trade, logistical and industrial hub. Western interference in the country threatens to create one more instable situation in a long line that started from Iraq and went on through the Arab Spring. Disagreements are an integral part of human nature and there is obviously a vast difference of opinion in Ukraine, but meddling by the West creates a serious danger of Balkanisation. Instability and violence in the country is not in the best interests of the region as a whole. Sergey Lavrov, in this article defined the Russian vision of a “common economic and humanitarian space stretching from Lisbon to Vladivostok, where free movement of people, free exchange of goods and services would be ensured.” For this to become a reality, an urgent compromise and ceasing of hostilities is needed in Ukraine. The solution for the problems in the country has to be both democratic and Ukrainian.